The East CrossTown Trail starts on Coal Creek Parkway at SE 79th Place, which it follows east on sidewalk to the Beit Tikvah Church on 136th Ave SE. The trail enters the woods on the north side of 136th, and continues generally southeast in dense woods along the side of a ridge, all the way to Cougar Mountain Park. Along the way there's a trail connection to Newcastle Vista, and a viewpoint, the Eagle Scout Aerie. Further along, the trail merges with the Terrace Trail coming up from the Highlands (and a trail connection to the May Creek Trail). Further still, the Terrace Trail branches left, ascending to the Terrace on steps, and the CrossTown Trail continues into Cougar Mountain Park and terminates at the DeLeo Wall Trail. See Extended Description below. 1. Cross Coal Creek Parkway to the north side of SE 79th Place and ascend an S-curve generally east to 134th Avenue SE. Turn right to cross SE 79th Pl toward Beit Tikvah Church. Here 134th becomes 136th Avenue SE. Turn left to cross 136th, and turn right along the sidewalk. Across from Beit Tikvah’s main entrance is a yellow fire hydrant. Turn left to veer around the fire hydrant and take the trail into the woods. 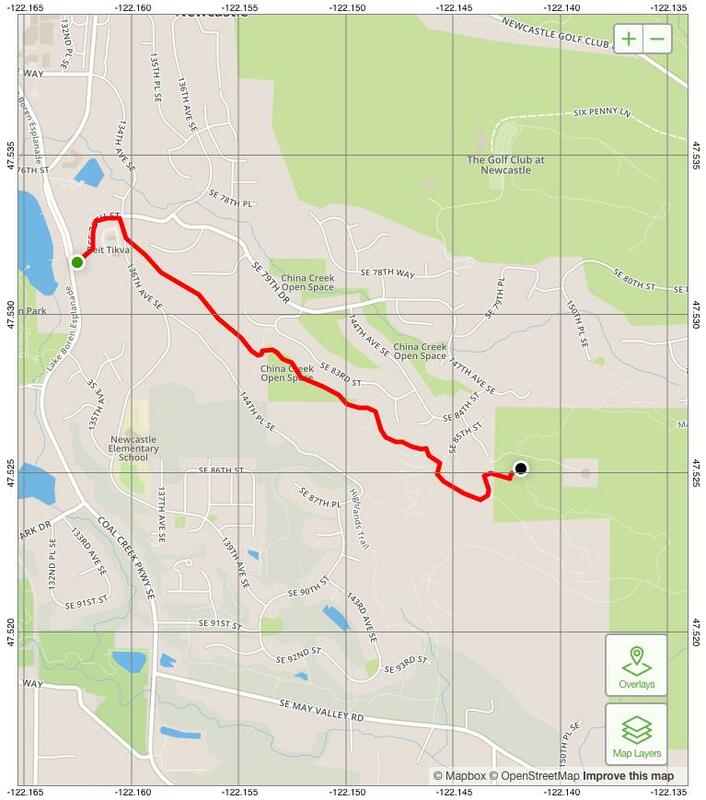 The trail has been roughed in by Washington Conservation Corps and is walkable to the Terrace Trail and on into Cougar Mountain Regional Wildland Park. Watch out for rocks and roots sticking up through the trail bed, and be careful not to step directly on the edge of the trail, as it might subside. An access half-way up can be reached by car; follow SE 79th Place east, turn right onto SE 79th Drive, right up a steep turn onto 141st Ave. SE, and right again onto SE 81st Place (Newcastle Vista subdivision). From the left side of the cul-de-sac, an access trail descends to the west edge of this subdivision. 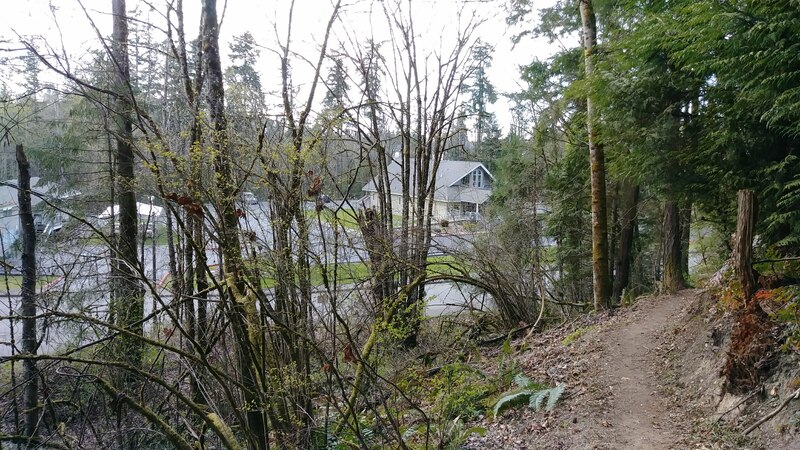 From the foot of the access steps, the Newcastle Vista Trail goes left toward Cougar Mountain Park, or right toward Beit Tikvah, reaching the CrossTown Trail in either direction to form a loop. As of the middle of 2018, over ¼ mile of the CrossTown Trail has been completed, and further work parties are needed. Help is welcome! Contact Peggy Price at Peggy@NewcastleTrails.org. Community service hours are available. 2. The trail route ascends generally SE. An access trail goes up to Newcastle Vista subdivision. From the Newcastle Vista Trail, an access goes up steps to SE 81st Place. Further along the CrossTown Trail, the other end of the Newcastle Vista Trail goes up to the left. Ascend a few switchbacks. On the way, a bicycle descent trail goes down to the left from the 4th switchback above the Newcastle Vista Trail. It follows a fence line down to the Newcastle Vista Trail. Descending bicyclists have the right of way only on this trail. Pedestrians have the right of way on the CrossTown Trail. 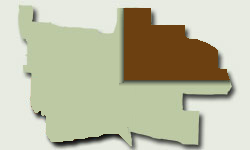 *Washington Conservation Corps is under the auspices of the Washington State Department of Ecology. It consists of a few supervisors and work crews of college students who dedicate a year or so to trail building in exchange for getting tuition and books paid by the State of Washington. 4. The steep section of the CrossTown Trail ascends southeast from the Terrace Trail to the De Leo Wall Trail in Cougar Mountain Regional Wildland Park. It has been partially upgraded and made safer by the Washington Conservation Corp.
View your map here .